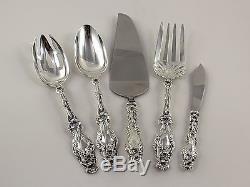 This listing is for a 5 Piece Serving Set by Gorham in the Lily pattern. They have the Gorham backstamp. Serving Spoon 8 1/2 Inches, Pierced Serving Spoon 8 3/8 Inches, Cold Meat Fork 9 Inches, Pie Server 10 1/4 Inches, Master Butter 6 5/8 Inches. 300 Grams + Pie Server and Master Butter. There are normal surface marks related to age and use and the item may need a polish upon receipt. Please reference each of the photos above for more views of the item. Please let us know if you have any questions about anything. 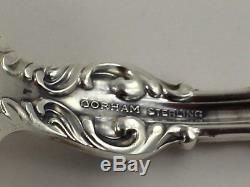 The item "Gorham Whiting Lily Sterling Silver Serving Set 5 Pieces No Monograms" is in sale since Saturday, November 5, 2016. This item is in the category "Antiques\Silver\Sterling Silver (. The seller is "mlimes" and is located in Columbus, Ohio. This item can be shipped to United States, Canada, United Kingdom, Denmark, Romania, Slovakia, Bulgaria, Czech republic, Finland, Hungary, Latvia, Lithuania, Malta, Estonia, Australia, Greece, Portugal, Cyprus, Slovenia, Japan, China, Sweden, Indonesia, Taiwan, South africa, Belgium, France, Hong Kong, Ireland, Netherlands, Poland, Spain, Italy, Germany, Austria, Israel, Mexico, New Zealand, Singapore, Switzerland, Norway, Saudi arabia, United arab emirates, Qatar, Kuwait, Croatia, Malaysia, Brazil, Chile, Colombia.